Flashback to the club activities and members in 1997 in the February 2018 newsletter. There is also a note on the new effort to enforce regulations regarding licensing for horse transport with a chart that anyone who trailers horses should look at. Jackie Sweeney had great success at the North Central Morgan Association show in August 201y, taking home Futurity Champion in Hand with her two year old stallion, Hylee's Letterman, and Futurity Two Year Old Pleasure Driving as well as Futurity Gelding in Hand,w with Hylee's Spotlight. I expect we will be hearing about these young horses this coming show season. Posted on March 13, 2018 by Heidi Harvey. January 2018 Newsletter-Happy New Year! Barb Knopf reports on horse news and help she's received since Joe's passing at LUVs Morgans in the January 2018 Newsletter. The club is proposing a work day at her farm to help out....a great idea. Check the current news feed for more info. The December 2017 newsletter reports on the Open Barn Day held at Hylee Farm as part of the National Day of the Morgan event. Jackie had 75 guests, 20 of whom got a riding or driving lesson. Nationally, 100 stables and farms participated, introducing hundreds, if not thousands, of people to Morgans for the first time. Dale and Sue Hammonds provide a detailed report on the neonatal maladjustment syndrome in the November 2017 newsletter. 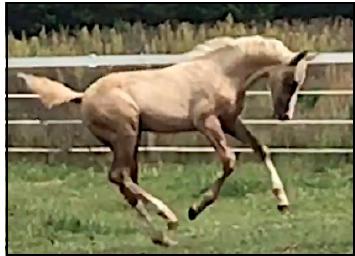 They describe the symptoms immediately after birth and how a new technique employed by their vet saved their beautiful palomino filly. This is a must read for any breeder! SDH Vision in Gold "Baby Doll" romps at 3 months after a close call in the first few days after birth. October 2017 Newsletter-Member Survey please respond! There is a member survey (page 10) in our October 2017 newsletter to help us understand what activities and modes of communication are of most interest to our members. Please fill it out and mail it back to MaryEllen, or type the answers in an email to her. Dressage team Alyssa Pedersen and 21 year old mare Tony Fennelly won hi point Jr. Exhibitor at Jubilee! Congratulations! Posted on October 21, 2017 by Heidi Harvey. Details of the September meeting, some beautiful SDH palomino foals and club shows results are in the September newsletter. Please send Heidi and Mary Ellen news if you are attending OKC or hosting an Open Barn Day on October 28th so we can publicize in the October newsletter. Posted on September 22, 2017 by Heidi Harvey. The Wisconsin Morgan Horse Club Parade Unit in the Baraboo Circus Parade. You can download the August 2017 newsletter here. Lots of nice photos of the Baraboo Circus parade and farm news and fun with horses. We also remember with gratitude Nap Bordeau and Joe Holder. Posted on August 17, 2017 by Heidi Harvey. Read up on the tour of the impressive Kohler Stables in May as well as the great practice clinic for club members hosted by Gary and Katz Jackson and conducted by Jackie Sweeney in June's newsletter. What a great state for Morgans Wisconsin is! An impressive row of buggies and carts at Kohler Stables. There are lots of great pictures and news from another successful Midwest Horse Fair in May's newsletter. Posted on August 16, 2017 by Heidi Harvey. Meet the participants at this year's Midwest Horse Fair in the April newsletter. You can also find bio information and details on demo times and schedules on our Midwest Horse Fair Page. Posted on April 21, 2017 by Heidi Harvey. The January 2017 Newsletter contains our slate of new officers, membership forms, and a good article on preventing winter colic. Our new president, Amy Ziegler, is particularly looking for ideas on how to grow our membership. The January newsletter also has a nice article and several photos about the unveiling of Annie Randall's mural portrait in Baraboo and the decorated tree in her memory at the Sauk County Historical Society. The February 2017 Newsletter has updates on Horse Fair and the club show, as well as a report on the nutrition presentation at the club meeting in February. There is a new policy regarding classified ads. Each paid member will now receive two classified photo ads on our web page for free (up to two pictures per ad) as a benefit of membership. The ads will run as text only in the newsletter and both newsletter and web ads will run for the calendar year. As hard as it is to believe, February and March are the high traffic months for web searches for the classifieds. Take advantage of this new benefit and get your classified in to Mary Ellen Gray and Heidi Harvey. FYI, you can advertise any horse related items, including tack, books, etc. The March 2017 newsletter unveils our T-shirt which will be sold at Horse Fair this year. Shirts are going to be $10 for sizes S-XL and $15 for size 2X. They come in red and blue. To order one in advance, contact Tamra at tama.jamma78@gmail.com. The March newsletter also profiles Chad and Myrna Rhinehart, the new owners of Iowa Valley Carriage Company, who will host the March meeting and contains the show bill for the club show in June. Katz Jackson and her granddaughter having some winter fun on a Morgan, of course! Posted on March 8, 2017 by Heidi Harvey. Our September newsletter is dedicated to our dear friend Annie Randall who passed away in late August and contains many photos, stories, and memories of a wonderful life full of friends, family, books, music, and Morgans. Posted on September 10, 2016 by Heidi Harvey. March 2016 Newsletter - 2016 Budget, Upwey Ben Don, Club Trivia Quiz! The March 2016 newsletter contains the proposed budget (page 14) which will be discussed and voted on at the March meeting. The actual income and expenses for 2015 are also shown for comparison. A fun club trivia quiz -- which will be challenging even for long time members -- and the answers are in this month's newsletter. Marsha Valence profiles the most important Morgan sire of the 20th century, Upwey Ben Don. Even 30 years after his death in 1968, more than 42% of Morgans foaled carried Upwey Ben Don's blood. We also remember with gratitude the life of veterinarian and horseman, Doc Sweeney. Posted on March 15, 2016 by Heidi Harvey. Lots of useful information is in the February newsletter, including the membership application form, the prize list and sponsorship form for the Wisconsin Charity Classic Horse Show, There is also information on the Midwest Horse Fair and an updated calendar with meeting and parade dates from now through summer. Posted on February 17, 2016 by Heidi Harvey. December's newsletter contains a very interesting article from the Vikers at Genetic Resources in Lanesboro, MN, on the sale and export to Norway of their in-foal mare, GR Obsession. Way to promote and preserve the Morgan breed! We also remember with gratitude the lives of Brian Earl Jackson and Jack Whalen. GR Obsession and her Norwegian speaking son Lind Ranger M-Uff da! Posted on February 2, 2016 by Heidi Harvey. The November newsletter will catch you up on the goings on with our members through the summer. There are many reports and lots of nice pictures of Morgan babies and activities. The newsletter also contains the membership form for 2016 (also posted on the Membership page) and slate of officers for 2016. Check it out! Posted on February 1, 2016 by Heidi Harvey. The October newsletter contains the report on the very successful and well-attended Field Day in late September, farm news from Castle Ridge Keep and Bridlesweet Farm as well as Morgan history on the great Morgan mare, Rena. Posted on January 31, 2016 by Heidi Harvey. This month's newsletter has pictures and reports from the Witwen Parade and the Baraboo Bigtop Parade. Read news from Kells, Lazycreek, Flower Valley, Blue Gable, and Tribute Farms and Oldfield Morgans and a report on WMHC Charity Classic Horse Show. Marsha Valance provides a historic Morgans article about Magna Charta. The June Newsletter features information on upcoming shows, parades, and the Morgan Field Day in August. The newsletter will be on sabbatical in July. Posted on June 4, 2015 by Heidi Harvey. Read up on the club's participation in the record shattering 2015 Midwest Horse Fair in the May newsletter, meet some new foals and read farm news from Lazy Creek Farm, Feather Ridge Farm, Oldfield Morgans, and Blue Gable Farm, and read detailed info on the upcoming club horse show. Jim Harris talking up Morgans with a reporter at the Midwest Horse Fair. Posted on May 19, 2015 by Heidi Harvey.